As parents, we could have never conceived that taking photos of yourself and uploading them online would turn into a hugely popular trend…. 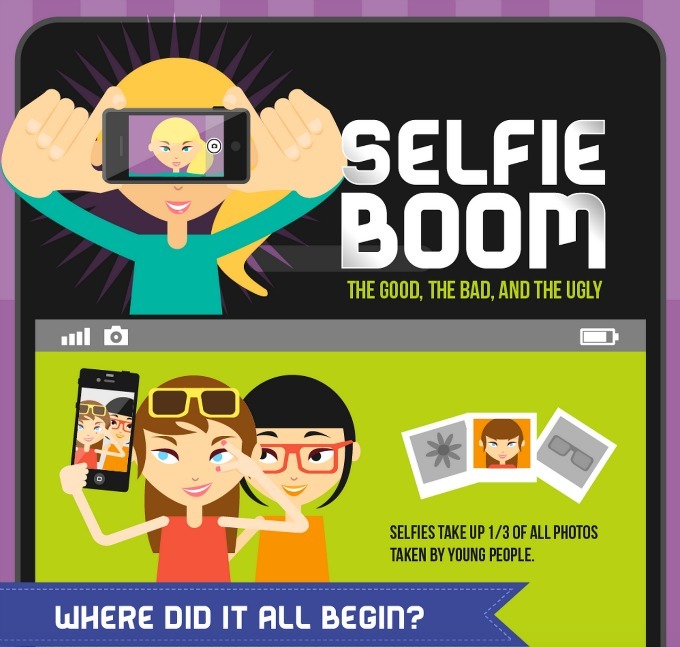 But for kids and young adults today, it has, in the form of “selfies.” Selfies first became popular during the days of MySpace, but they really took off when the iPhone 4 was released in 2010 with a front-facing camera. Aside from being slightly obnoxious, is there anything really wrong with this fad? According to the infographic below, there seem to be some mixed opinions on the subject. While there are those who believe selfies promote a healthy self-image, others think that frequently snapping photos of oneself only breeds narcissism and a preoccupation with self. So which is it? At the end of the day, it comes down to your child and knowing what they’re like. If you find that selfies are instigating poor personality traits, it might be time to have a little chat and let your child know some of the drawbacks of this trend. Because unfortunately, it doesn’t look like it’s going away anytime soon.